Spring is in the air--time for insects to make their appearance. Do you like insects and spiders or do they just bug you? Whether you're a hexapoda aficionado (bug lover) or a you have a arachnophobia, it's important to understand insects and spiders and their place in the environment. Here are free printable insects activities and bugs lesson plans. If there's something creepy crawly in your neighborhood, who you gonna call? Bug Busters, aka Orkin Pest Control. 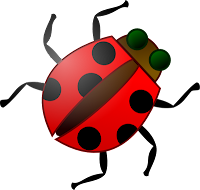 Check out Orkin's online learning center for free printable insects lesson plans, bug identification charts, insect coloring pages, bug information, insect activity booklets, games, puzzles and worksheets. Edupics has over 100 free printable insects coloring pages and 41 butterflies coloring pages. For more coloring book fun, visit the Grand Rapids Parenting Examiner at Free Coloring Pages 4U and for educational activities, Free Printable Lesson Plans.